Only E3 can provide classic moments like this. The run-up to E3 is almost as exciting as the event itself, with half the fun in predicting exactly what Nintendo will show. Not every company is as secretive however, as a recently published list reveals the show will play host to at least fifteen DS games and twenty titles for Wii. That may not seem like a huge amount, but bear in mind this list doesn't include SEGA, Ubisoft, Capcom or Nintendo itself, so expect that list to swell during the days of the conference itself. It's also interesting to note there's no WiiWare on the list, with only the recently-announced Animal Colour Cross confirmed for a DSiWare showing, but hopefully there'll be some pleasant surprises revealed for fans of downloads everywhere. All I care for are Zelda and Golden Sun tidbits. sighs There better be a F-Zero in there! I'll be watching it alone and staying FAAAR away from forums. Sweet, looking forward to next month! Alright Nintendo... show em' what you got!! Good luck to Capcom, Sega, and the other gangs too. Star Fox! Star Fox! Star Fox! Star Fox! I hope they give us something we've all been dieing to have. Hoping there's another Mario game for me. Get a load of Reggie & Cammie duking it out in Wii Sports Resort's swordplay dual match. Reggie vs. Cammie? 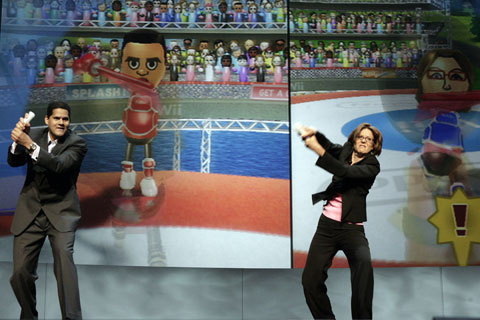 Reggie vs. Bill, Reggie vs. Iwata.... REGGIE VS. MIYAMOTO? Any news on Zelda?? Not. Damn. Grease? Will that movie never stop haunting me?! Well, Nintendo must deciding what to show and what to delay. I'll simply do what I've one last year and keep refreshing the NL home page and conversing with friends on PSN and the Wii. A wonderful choice of picture there James. I hope we get announcements of the mother series coming to the west. I am hoping for more QUALITY games that use Wii Motion Plus, because there aren't many. Other than that, I'm pretty sure Nintendo's going to give out news on the new Zelda game (including the real title) and I think Mario Galaxy 2 will have a demo there. The most awesome thing that could happen at E3 this year would have to be if Nintendo unveiled the 3DS. E3 is always exciting. I want a Zelda blowout to get excited for that, and an announcement of Starfox Wii and/or Pikmin 3. Over 30 Nintendo titles you say? Like another poster said F-ZERO! That game would be awesome and i could finally wipe the dust off my wii wheels. Ok, but I looked at the list and there really isn't much there. Most of it either has the stench of shovelware, or is crossplatform stuff such as Madden '11 and Rock Band 3. Not that there's anything wrong with the latter kind, but I don't see much to get excited about. Overall the list is pretty unexciting for all platforms. Hopefully better stuff is coming. That's all they need to win the console war. Let's face it, that's why we're Nintendo fans. Excellent game-play combined with excellent expectation delivered. Come on Nintendo! Give us what we're craving!!! lz is right; that headline IS misleading. Makes it sound like there's over thirty FIRST PARTY games coming. NoA's localization crew would have to put in some SERIOUS overtime to give us enough backlogged games for that! Most exciting news I've heard today: Color Cross (and the DSiWare Animal version) coming to America. We need more Picross-related stuff in this country! There's no game for Wii or DS on this list I would get excited about. Can they promise me no Cammie Dunaway? Then I will get excited. Yeah, we need a new picture done for E3 this year, I predict Miyamoto vs Iwata in Wii Party!